Do you want to glide through your next workout? Sliding (or gliding) discs are a must-have piece of total body training equipment. Whether you are looking to get your fitness on the fly, build muscles, burn fat, or increase your strength and stability, these powerful, portable discs are a great tool for every exercise enthusiast. Gliding Discs can be purchased for as little ten bucks. However, if you are looking to invest in a solid fitness routine and not another piece of gym-related equipment, these discs can be substituted for a paper plate or hand towel. *Note: for best results use on carpeted floors. *Fit tip: keep control of your disc. Avoid falling into a split position by slowing moving through each repetition. Finally! A leg leaning lunge that strengthens your core, glutes, quads and hamstrings without putting unnecessary pressure on your joints. 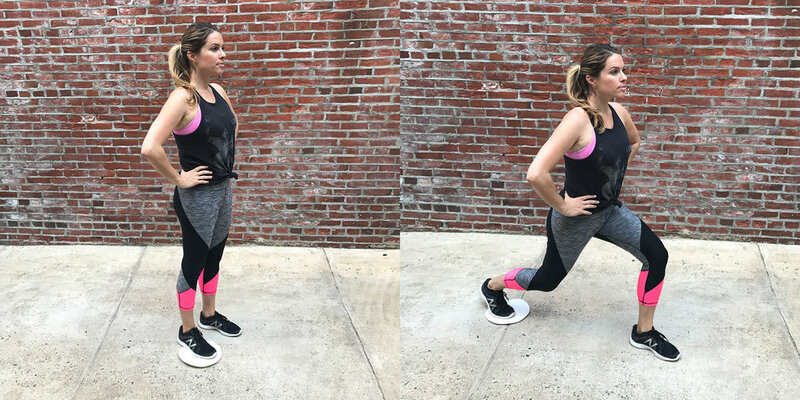 Unlike a standard lunge which focuses on lifting your leg to step forward, backward and from side-to-side, the sliding lunge keeps the weight-bearing leg stabilized to help increase gains while reducing the risk of injury to the knee joint. Position the ball of your right foot in the center of the glider. Stand tall with your core muscles engaged (this will help maintain your center of gravity). Slowly extend the right leg back until the left leg forms a 90 degree angle at the knee. Keep your right knee soft with a slight bend at the joint. Keep the body balanced as you push through the left heel, returning the right leg to the starting position. Gliding discs allow for a smoother transition between repetitions, which helps keep your joints safe and healthy. When performed properly, mountain climbers are a triple threat exercise. They torch calories, tone muscles and perfect overall stability. However, it’s easy to experience faulty form from the repetitive joint jarring jumps necessary to complete these climbers. These alternating jumps can affect hip, shoulder and hand alignment which causes the wrong muscles to feel the burn. Place your right foot in the center of one disc and your left foot in the center of the other disc. Elevate your body into a hand plank position, distributing your body weight between your hands and feet. Keep your core muscles tight and the hips in line with your shoulders and heels. Briskly drive the right knee up toward the chest then return it back to the starting position. Repeat on the left side. Steadily continue this alternating sequence for sixty seconds. We all know how beneficial a plank position can be for banishing belly fat and toning tummy muscles. Plank pushes take this already fierce exercise to the next level by isolating the abdominal, chest and shoulder muscles. Start in a forearm plank position, with the disc positioned slightly outside of your right hand. Once you are stable in your plank position, elevate your right arm and place it on the center of the disc. Push the disc away from your body until your right arm is fully extended, then return the disc to the starting stance. Repeat ten times before switching sides to your left hand. Incorporate toning toys into your workout to keep exercise exciting and enjoyable.